Please answer the simple math question. We all want to maintain good oral hygiene and prevent cavities but often dont realize the problems created by what we eat. What you eat,how you eat it are very important factors in maintaining good oral health. Good and sometime bad changes start the second you eat certain types of foods. The Bacteria in your mouth normally converts sugars from the foods that you consume into acids. Some types of acids can start attacking the enamel on your teeth thus speeding up the natural decay process. The more often we eat or snack, the more often you exposing your self to foods that may stain your teeth. There are many reasons that people come to Thailand, one of the best known aspects of Siam is Thai Food which is considered one of the best cuisines in the world. There are some very unique herbs and spices that you will not find anywhere else on earth, unfortunately some of them are also pretty harsh on the teeth and dental enamel. Though “Thai fast food” or stir fry’s are the most popular in Thailand, Thai cuisine is still considered one of the healthiest foods because of the types of vegetables, herbs and spices used. Common Ingredients used in Thai dishes are basil, galanga (part of the ginger family), lemongrass, coriander, lime and of course hot chilies. Each of these spices is good for the body, but some of them may be too hot or too acidic for some. 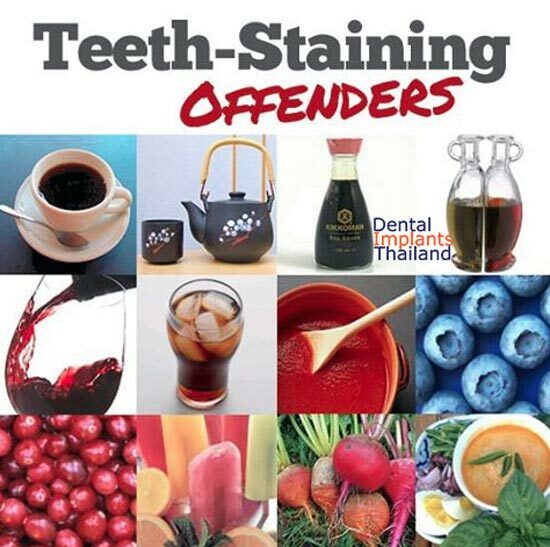 Luckily, One of the most popular Thai Dishes is also one of the safest for you to consume after having your dental implants or laser teeth whitening in Thailand. Tom Yum soup, is hot and sour soup and one of the most well known Thai foods on earth. Recent studies done by the Kasetsart University in Thailand and Kinki University in Japan has proven that Tom Yum is effective in helping prevent certain types of cancers. The Tom Yum soups usually only us fresh ingredients to make the soup also making it one of the best comfort foods for Thai Foodies. Tom Yum soup can quickly relieve you from sinus problems and help countermeasure that stubborn cold only after a few yummy slurps. The best part is that Tom Yum soup is very safe and will not stain your teeth unlike other soups. The modern way where pre made tom yum paste is used as a base of the soup. Boil 6 cups of water in a medium sized pot. Once the water has boiled, mix in the Tom Yum paste. Let it boil for another 5 minutes before adding the chicken breast, mushroom, garlic, tomatoes, lemongrass, galangal, and basil. Allow the meat to cook for a 5 to 10 minutes, in medium heat. When all ingredients are cooked, add the chilies. The amount of chilies should depend on your tolerance over spicy food. This recipe doesn’t require any fish sauce because the tom yum paste is already filled with flavor. Tom Yum can also be served with rice. To learn more about Healthy Thai dishes or to learn more about dental holidays to fix your teeth in Thailand please contact us today. The Dental Centers of Thailand provide dental holidays with the Best Dentists and Surgeons in Bangkok and Phuket. Our Center offers several affordable dental treatments including:Vaneers,Crowns, Mini Dental Implants,Zygomatic Implants,Bridges and Teeth Whitening in 1 Hour. Fixed Prices With No Hidden Charges!